Beginning in March, new, safer routines for specification of travel expenses and own expenses will be introduced in Primula. Confidence for those approving the travel expenses or expense increases, and the risk of errors decreases. Travel expenses and compensation for own expenses have been handled for a few years in the Primula electronic system, while the original receipt and other documentation have so far only been sent in paper format to the Payroll Office. This set-up means that the person certifying (inspecting and approving) the travel expense or expense does not have access to, and cannot see, the documentation or receipts since they are found only at the Payroll Office. This is why, beginning in March, new routines will be introduced that involve the receipts, apart from being sent in the original to the Payroll Office, also being scanned and attached in Primula. This way, the person certifying the expense can see and assess all documentation. “This element of inspection existed before, when we had manual handling, but it disappeared in connection with the transfer to electronic handling,” Ms Frode Blomberg said. The new routines increase confidence for those doing the certifying, and reduce the risk of mistakes and irregularities. 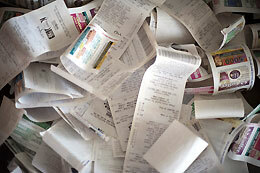 According to law, the original receipt must be saved for ten years. This is why they must be sent in paper form to the Payroll Office. This does not apply, however, to ‘itineraries’ – the travel plans received in the post from the travel agency – or syllabi and conference programmes. They are not counted as originals, but can only be attached as electronic files. Each month, LiU pays out nearly one million SEK for expenses via Primula. Above all, they are expenses for hotel stays and restaurant visits in connection with travel abroad. But there are also expenses for entertainment, books, papers, computer accessories and laboratory material. Yet another new routine is the order of certification. Up until now, immediate supervisors have certified travel expenses and expenses, regardless of which cost center is charged.